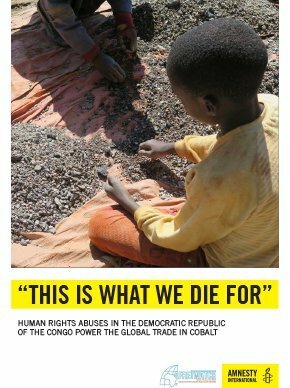 This investigation by Amnesty International examines human rights abuses in the extraction of cobolt and the extent to which manufacturers have conducted due diligence in sourcing cobolt for mobile phone production. People around the world increasingly rely on rechargeable batteries to power their mobile phones, tablets, laptop computers and other portable electronic devices. The growing global market for portable electronic devices and rechargeable batteries is driving the growing demand for the extraction of cobalt, a key component in lithium-ion rechargeable batteries. This report, jointly researched by Amnesty International and African Resources Watch (Afrewatch), examines the conditions under which artisanal miners extract a significant proportion of the world’s cobalt supply, and then traces how this mineral is traded. The report assesses the extent to which companies have put in place human rights due diligence measures to know where the cobalt in their products comes from and the conditions under which it is extracted and traded.